First Line: "The cadets surrounding me are wilding out." Review: In The Edge of Forever, we are introduced to Alora and Bridger. Two teenagers from two completely different times. Alora lives in 2013 and Bridger is from 2146 where things such as time travel actually exist thanks to genetic manipulation. While on a separate mission Bridger bumps into his deceased dad and is told to save Alora. He doesn't know who Alora is or why his dad would ask him to defy all time traveling rules set in place to save a girl from the past but evidently it must be important, so Bridger shifts to 2013 illegally. The book had a lot of suspense you didn't know who was the bad guy or why Alora was in danger and what could possibly be so important about her until the very end when it all came together. The Edge of Forever was a fairly quick read for me, seeing how I love time travel books, but the ending was kind of a let down the person behind it and their reasoning was just lackluster. But I do have to give credit to the author, for once I did not figure out who the killer was until the big reveal so thanks for keeping things unpredictable in that aspect. As far as Bridger and Alora go I liked them both although I do have to admit I liked Bridger more than Alora since there wasn't anything that made her stand out and there was just way too much high school drama surrounding her. As for Bridger, he was a whole lot more interesting and yes him being from the future had a lot to do with it. I wanted to learn more about the time he came from, it was a hell of a lot more interesting than 2013. 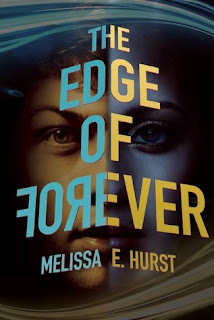 Overall if you like time travel or dystopian I would say check The Edge of Forever out, it was a quick read although if I have to compare it to other time travel books, not the most memorable.